The PM offered respects to the deceased by laying flowers at the photograph of Pravin Patel. He also shared pictures of his visit on Twitter saying, "Met Shri Keshubhai Patel at his residence and offered my condolences on the unfortunate demise of his son, Pravin Patel." 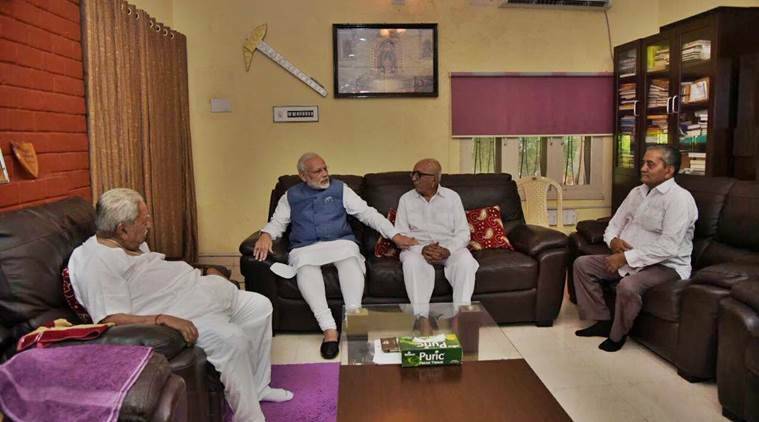 Prime Minister Narendra Modi visited former Gujarat chief minister Keshubhai Patel at the latter’s residence on to condole the death of his son Pravin Patel. The 60-year-old died of heart attack in the United States a few days ago. BJP national president Amit Shah had also paid a visit to the Patel residence earlier to pay respects to Pravin, news agency PTI reported. Gujarat Chief Minister Vijay Rupani also condoled the death. Rupani divulged that he and Pravin had been classmates in Rajkot and were of the same age. “Pravin and I had studied together in Rajkot he was of my age. He has died at a young age. I have spoken to Keshubhai and conveyed my condolences,” the chief minister said. PM Modi reached Ahmedabad on Wednesday evening to receive Japanese Prime Minister Shinzo Abe. The two on Thursday morning launched a bullet train project. The train, which will run between Mumbai and Ahmedabad, will be developed with Japanese expertise. At an event in the state capital, the two leaders informed the audience that Japan had sanctioned a loan of Rs 80,000 crore for the project to India on an interest of 0.1 per cent, which Tokyo expects to be returned in 50 years.